STEAM: Music and Science Making Music Together! This trimester, the third graders experienced STEAM (Science, Technology, Engineering, Arts, and Mathematics) in their music and science classes. In music, they studied how an instrument produces sound, especially percussion, woodwinds, and strings. In science, they explored volume and pitch as they created a woodwind, string, or percussion instrument from recycled materials. 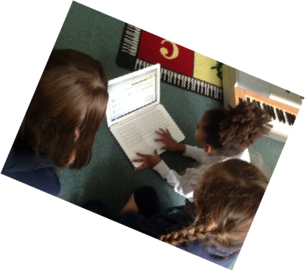 To complete the project, the students used the knowledge that they have acquired from their years of music classes and wrote the notes, rhythms, lyrics, and accompaniment (using Noteflight and Soundtrap) to a song that they will perform on their newly created instruments. In these videos, you are seeing their songs come to life. To read more, click here. The STEAM unit begins in April, following the third graders’ Adventure America Social Studies unit. During that unit, the students study songs about the 50 states, such as Fifty Nifty, 50 State Rhyme, and Tour of the United States. When the STEAM unit begins, the students learn about sound, volume, and pitch in science class. In music class, they study pitch and sound through experimenting with water and beakers. I give them a project-based learning assignment where they are told that they have lost their recorders due to flooding in the school. They are given water, beakers, and markers to recreate their recorder piece, Land’s End by Don Muro. The students are divided into groups and experiment with the water and beakers, using the markers as the mallets, to perform the piece. The students master the concept of how water affects pitch and produce a beaker that can play the pitch G, a beaker that can play the pitch A, and a beaker that can play the pitch B. The students then perform the song with the accompaniment. Once completed, we study the way instruments produce sound, particularly woodwinds, percussion, and strings. We watch the House of Sound Videos to assist with lessons. In science, the students are designing their own instruments by making a blueprint of their instruments and devoting some time to selecting recycled materials to build their instruments. 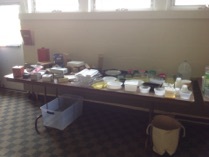 The science teacher has collected numerous materials for them to use and structures the classes devoted to creating the instruments so that the students can experience and recall their fails and successes. Once completed, the students record their details into the Seesaw app. In music class, they bring their instruments and we tune the strings and woodwinds. The percussionists were instructed to create an instrument that can give a low and high sound, along with an item that can make a sustained pitch to emulate a cymbal. The students use Noteflight to compose an 8-measure melody using the notes B A and G (the notes that they have mastered on the recorder). They use SoundTrap to create an accompaniment to their melodies. These accompaniments are created in a certain style, such as RnB, EDM, Jazz, Pop, or Rock. Each group works together to compose the melodies and create the accompaniments. Once they have completed this portion, they write lyrics to their melodies that use the facts they learned about the United States from their Adventure America studies. At the conclusion of the unit, the students perform original compositions on their newly created instruments.